Each player gets the items of his color which he places in front of his screen visible to all, and 5 GP which he hides behind his screen. 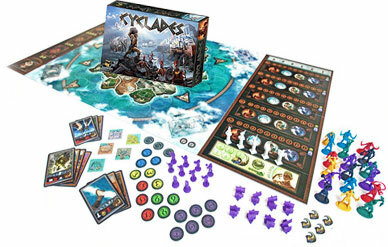 Place the game boards, Troops and Fleets according to the number of players, as indicated on the illustrations on pages 7 and 8 (you'll find numbers corresponding to the number of players at the bottom of each board). Shuffle the Mythological Creature cards and place them, face down, in a pile on the proper place. Place the 5 figurines next to the discard pile. Place the Philosopher cards and the Priest cards on the place reserved for them on the board. Each player takes only one of his offering tokens. These tokens are shuffled and randomly placed on the first places of the game turn (the second offering token is only used for two-player games). Leave the 4 God tiles next to the game board. The building tiles, the Metropolis tiles, the two special dice, the prosperity markers and the GP which have not been given out are set aside while not in use in the game. then make offerings to the Gods (auction). It will sometimes be necessary to spend much in order to gain the favors of the God of your choice. finally, depending on the God whose favor you obtained, perform the actions specific to that God (each God has a "free" action, while others can only be used by spending more of one's precious GP). The goal of each player is to own two Metropolises at the end of a cycle (either by building them and/or by conquering them). The game ends at the end of a cycle if at least one of the players has completed this objective. If multiple players reach this goal in the same cycle, then the richest one (whoever has the most GP) wins. Discard the Creature on the "2 GP" space if it wasn't used during the previous round. Then move all other cards to the right, in order to fill all empty spaces. Finally, fill the remaining spaces by drawing new cards. When the draw pile is empty, shuffle the discard pile to create a new draw pile. During the very first cycle, draw the first Mythological Creature and place it face-up on the left hand space on the track (4 GP). During the second cycle, if this Creature has not been used, move it one square to the right and put the first Creature from the draw pile face-up on the space which was just freed. (If it was used, place the two first Creatures from the draw pile on the 4 GP and 3 GP spaces). The order in which the Gods grant the players their actions changes at the beginning of each cycle. The 4 large God tiles are shuffled and placed randomly on the 4 empty spaces above Apollo's space. In a game with 5 players all 4 tiles are placed face-up. When playing with 4 players, the last of the 4 Gods will be placed face-down. It will not be available for this cycle. During the following cycle, you will place this God in the first space, face-up, and shuffle the other 3. Once again, the God placed in 4th place will be face-down and will become first God during the following cycle. When playing with 3 players, the first two Gods will be placed face-up and the last two face-down. During the next cycle, the two Gods which were face-down will be used. On the cycle following that, the 4 Gods will be shuffled again to make two new random pairs. Each city earns gold pieces (GP) according to the prosperity of its isles and of seafaring commerce. Each player gets 1 GP for each prosperity marker he controls. 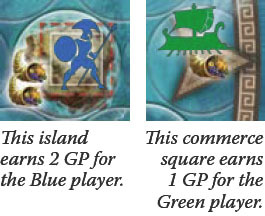 The prosperity markers are present on multiple isles (printed on the board, then present on the board as markers due to Apollo, as seen on page 6), as well as certain sea spaces (printed on arrows which represent the fact that present ships are trading with other nations). The GP earned by the players must be hidden behind their screens. To gain the support of the Gods and the actions associated with them, the players will have to sacrifice part of their riches (GP). In the playing order, each player chooses a God and places his offering marker on the space corresponding to the offering that the player wishes to make to that God. If an offering goes over 10, the player places one of his territory markers on the 10+ space, with the offering marker then indicating any remaining number beyond 10 (example: to bid 13, a player places his territory marker on 10+ and his offering marker on 3). The offering must then be higher than the one already taking place. The player who made the previous offering must take his marker back and must immediately bid on a DIFFERENT God. It is possible that the player thus outbid will outbid another player. Any such case must be resolved before the next player in the turn order places his offering marker. Any player may place his offering marker on Apollo's space without spending anything, as only Apollo does not require any offerings. It is possible for multiple players to choose Apollo in the same cycle. The first player to choose Apollo places his token on the 1 space, the second on the 2 space, etc. The offering phase is over when each player has placed his marker on a God. Each player pays the number of GP he offered to his God, taking into account any possible reductions due to Priest cards. Important: even though the number of GP each player has must be kept secret during the game, it is forbidden to make an offering you can't afford! The Gods' wrath would be terrible! The Gods are activated in the order determined at the beginning of the cycle. The player who has won the offering bid on the first God can perform, in the order of his choice, the actions specific to that God, and use a Mythological Creature by paying the cost corresponding to each of those actions. The 4 main Gods work in the same way. Only Apollo is different. It is possible to alternate actions (example: recruit, built and recruit again). When the player is done with his actions, he places his offering marker on the last free space of the turn track. It is then up to the player who won the offering bid on the next God to perform his actions. Click for more information about the actions. Once every player has played and replaced their offering marker on the turn track, the round is finished. If one or more players own 2 Metropolises, the game ends. Otherwise, a new cycle begins. The game ends at the end of a cycle where at least one player owns 2 Metropolises. That player wins the game! If more than a single player ends the cycle with two Metropolises, it's the player who has the most GP remaining behind his screen who wins. 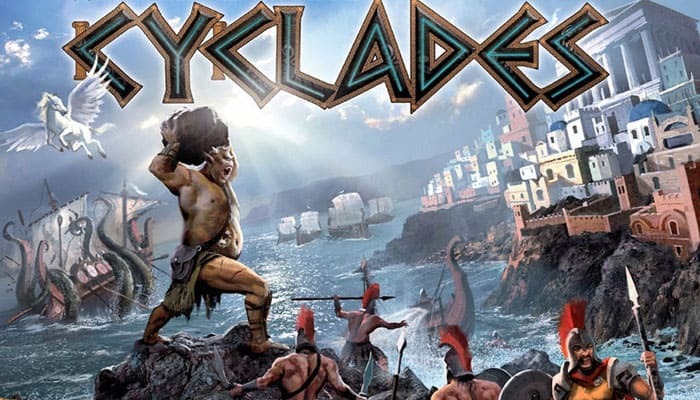 A player who has all 4 types of buildings (Port, Fortress, Temple and University), even if they are spread over many of his isles, must immediately discard them and replace them with a Metropolis token, which he places on an empty space on one of his isles. If there are no free spaces, the player must destroy one or more of his buildings to free the space required to place his Metropolis. A player who has 4 Philosophers must immediately discard them to earn a Metropolis.The player places the Metropolis token on an empty space on one of his isles. If the only available space is occupied by buildings, the player is forced to destroy them to place his Metropolis. If a player only has one isle on which he already owns a Metropolis, his 4 Philosophers are simply discarded (the new Metropolis "replaces" the old one). There's a third way to earn a Metropolis: conquer an isle where there's already one! A Metropolis is a "super building" which has the powers of all other buildings.